Remember that a longer length does not apply to all situations. You’ve bumped to the right guide that highlights what you need to know about the best RV water hose. Today, you’ll discover the things you should look for an RV water hose along with the types that you can choose from and use in your rig. More so, you’ll learn about the top picks in the category so that you can later decide on what to choose based on their individual features and advantages. If you’re ready, let’s begin. We’ve prepared a top 10 list of the best RV water hoses made from durable and high quality materials. They are top-rated by RV owners to have the performance and solid features that they can rely on. Check them out. The Camco 22853 is the best RV water hose in the category for reasons. For one, it gives us the total value of our money because it is heavy-duty. When shopping around for a new RV hose, it is one thing that we must look for to ensure it works long time. An impressive feature of the Camco 22853 is 20% thicker than standard hoses, meaning it can withstand punctures well. It also has an anti-kink design that also features strain-relief ends and machined fittings that make the hose more durable. Another thing that makes it durable is that it’s UV stabilized. It only means that it can withstand even sun exposure. Its performance won’t degrade. I also liked that it is a safe hose, which is made without BPA, lead or phthalate. With that said, we can ensure that the drinking hose is not harmful to our health. So it is not only for long-lasting use for also safe for the health. I would also like to note that it’s certified by the NSF for guaranteed quality and safety. It is also CSA certified proving it is safe for drinking water and has low lead content. This product also complies with the Vermont Act 193 Low Lead Laws and California’s AB1953. You can also count on it for its long length of 50 feet and diameter of 5/8 inches. Overall, it is the best RV hose for its top performance, safety and quality. It is also long and thick enough to meet all demands. Choose it if you’re looking for a reliable and durable hose for your camper, cabin, mobile home or travel trailer. If you’re looking for a reliable hose for your drinking water in your rig, you might want to take a second look at the Camco’s TastePURE drinking water hose. I liked its high quality construction and design with max kink resistance. It only means that it won’t give you a hard time to control or use the hose. The Camco 22783 is reliable that it is useful and safe for your drinking water. You can easily connect it to your faucet without any hassles. It is ideal for homes, cabins, campers, mobile homes and travel trailers. You can use it anywhere you need a safe and certified drinking water hose. This hose is made without BPA or PVC, which are unsafe for the health. Speaking of safety, this product is certified to contain low lead, meaning it won’t harm your health with the chemical. The drinking water hose is also compliant with the Vermont Act 193 Low Lead Laws and California’s AB1953 Laws. The hose is also long enough at 25 feet, making it convenient to use and connect to the drinking water faucet. You can also have peace of mind that it is thick enough at 5/8″ID. Safe drinking water matters wherever you are. For this reason, you need a dependable RV water hose like the Camco 22783. Overall, it is one of the best RV water hoses to choose and use in your rig. The heated RV water hose is another top choice for a durable and high quality hose. It is a reliable hose, which is guaranteed to last long even at freezing conditions because it features a freeze protection, which ensures you can use it even in the winter. This model is also the one to choose if you’re looking for a drinking water hose that can regulate heat source to ensure that water will keep flowing but without overheating. Using it, we don’t also have to use a temperature controller or a thermostat, eliminating the need to buy one in order to monitor the temperature. The drinking water safe hose is NSF 61 certified, ensuring its safety for drinking water. 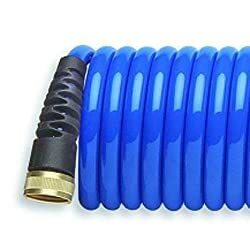 When shopping around for a drinking water hose, you should also look for one that comes with heavy-duty heat shrink, providing each of the hose’s ends with strain relief. This hose also comes with female hose fittings that make it ideal to use with campground power source or RV power. Finally, I liked that the hose can operate on 2.27 AMPs and 120VAC. Overall, the ½ inch ID Heated Drinking Water Hose with a self-regulating heater is what you need if you like to keep water flowing even in a very low temperature and is able to withstand overheating. The NeverKink 8612-50 is one of the best choices around when it comes to reliability and durability. One thing I liked about this drinking water hose is that it never really kinks or tangles. It is by the world renowned Teknor Apex, the first US hose manufacturer that introduced a kink-proof hose on the market. This hose is one of their best offerings with the non-torsion system. 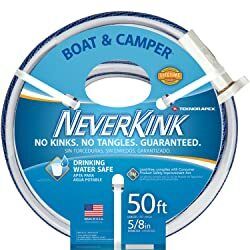 It has a translucent strip, which is running its entire length to show the never kink system that is able to solve the common consumer complaint that is kinking. Kinks, tangles and twists cannot get started with this hose, and that’s one of the things that I would like to note about it. For this reason, this hose is very easy to maneuver and use. This product is also made with FDA sanctioned materials, so it is guaranteed safe for drinking water. I also liked that it has a tough sleeve, which is able to prevent its kinking at the faucet. You will also appreciate that it comes with a leak-proof coupling that makes it easier to attach to your faucet. When it comes to safety, you can have peace of mind that the hose is compliant to the Consumer Product Safety Improvement Act, proving it’s lead-safe. And with its patented Reflex Mesh technology featuring a mesh network of reinforcement, you can relieve yourself from worries that it is easy to maneuver. 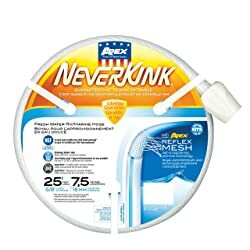 Overall, the NeverKink 8612-50 is for you if you’re searching for a drinking water safe hose that is ideal for use at homes, campers, cabins, mobile homes and travel trailers. If you’re looking for a drinking water safe hose for your yacht, home or RV, you might want to take a second look at the Teknor Apex 8503-25. It is one of those I would like to recommend for its quality and durability. This hose can withstand heavy demands in your rig or home because it is made with heavy-duty materials. Another thing I liked to mention is that it’s made with lead-free materials, meaning it won’t harm your family’s health. 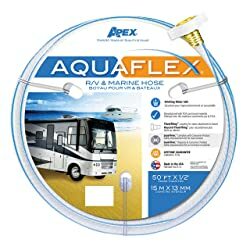 It is important factor we have to look into when shopping around for a good RV hose that can keep up with our needs while also ensuring the safety of our loved ones. I’d also like to note that the hose complies with the laws including the Customer Product Safety Improvement Act. You can have peace of mind that it passes standards and tests. One more thing good about the Teknor Apex 8503-25 is that it is designed with ThumThing coupling. What it does is providing an easier way of attaching our hose to our faucet. With that said, we can experience the convenience of using the hose anytime. You will also have peace of mind that it is able to eliminate tangles, kinks and twists for its NTS reflex mesh technology. It is also one of those that are certified safe for drinking water. This product also has an ideal size of 5/8 inches in diameter and 25 feet. Are you looking for a certified safe drinking water hose? If you do, you can never go wrong with the Camco Heated Drinking Water RV Hose. One thing I liked about it is its core, which is made with BPA-free, phthalate-free and lead-free, that makes it safe for drinking water. It is a sure value for our investment because we don’t have to worry about an unsafe hose to use for our drinking water. Unlike standard hoses that can leave chemical or plastic taste in the water, the Camco Water Hose does not. Water passing through it is safe for drinking and cooking. I would also like to recommend the RV hose because it can be used for homes, agriculture, livestock as well as commercial or industrial uses. You will also like to know that it features the energy-saving thermostat that only heats whenever needed. It only means savings on electricity. Who won’t like that? When it comes to durability, nothing will also beat the Camco drinking water hose because it features machined and plated fittings, which can resist corrosion. In addition, it comes with a high quality and heavy-duty exterior jacket, which can protect its electrical components and water hose from external exposure and damage. The Camco water hose also has an anti-freeze protection down to -28˚C or -20˚F. Using it, we can have peace of mind that water will keep flowing even at low extreme temperature. 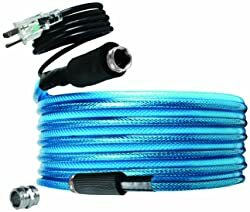 You will also love to know that it comes with a female to male adapter, allowing us to connect it to the water source on either of the hose’s end based on the electrical outlet’s location. Finally, this hose can operate at a standard 120VAC. Overall, it is a great pick for RV owners looking for a reliable and heavy-duty drinking water hose that lasts long and serves its purpose well. There is no doubt that Valterra is one of the most trusted brands for RV gears and systems. When it comes to drinking water hoses, they have the Valterra W01-5120 that delivers top performance and keeps up with the brand’s commitment to offering us only the most reliable RV products that last long and performs well even surpassing our expectations. One of those things that separate the Valterra W01-5120 from the rest is its superior engineering. It is made to keep up with high-pressure water hookups. It only means no leaks and waste. If you’re looking for a tough product to deal with such high pressure RV hookups, you might not have to look any further but choose the W01-5120. When it comes to water flow, we should be looking for something that can save us the time, and that’s one thing that makes the hose unique. It offers high flow fittings that ensure not only leak-free operation but also high water flow rate. Best part is that this product can also operate at up to 160-psi pressure. For safety, this product is made with NSF listed materials to guarantee its safety for drinking water use. And for convenience, this product boasts its hose gripper included for easier operation. Overall, you might want to consider the Valterra drinking water hose if you’re searching for a hose engineered to work at high water pressure and is made of high quality and safe materials. 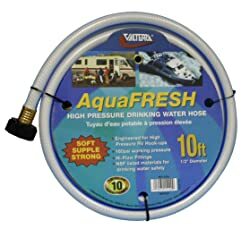 Another product not to miss when looking for a drinking water hose in our RV is the Valterra W01-5048 especially if you’re finding a hose that can operate even at high water pressure from the hookup. It is a great choice for RV owners looking for a dependable water hose that can deliver top performance all the time while maintaining its durability to keep up with the harsh and changing outdoor conditions and elements. And whenever you’re parked in a campsite where there is a high-pressure water source, you should use a drinking water hose that can keep up with it. This one can handle up to 160-psi pressure, so you can have peace of mind that it can keep up with tough uses. The product is also top rated for its solid features, including high flow fittings that ensure a leak-free operation. You can always depend on the hose that is also made with NSF listed components to ensure its safety for drinking water use. I’d also like to recommend this product for its complete accessories including a hose gripper that adds to convenience of use and top performance that we all need. Overall, it is a decent choice if you’re looking for a heavy-duty, high quality and reliable drinking water hose by a trusted brand. So whenever camping, you can relieve yourself from worries because you have a dependable hose around to keep up with your camping or RVing demands. 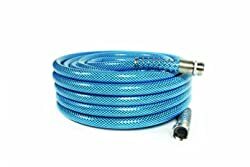 The HoseCoil RV water hose is another top product we should not miss in terms of the best water hose for our cabins, homes, campers, travel trailers and mobile homes. One of its benefits is its compact storage feature. It is easy to store because it can coil to its entire 15ft length to only less than two feet. What else can be more convenient than that? It only means that it does not take up much space in storage versus an ordinary garden hose does. That said we could save space in our rig and use it for other purposes. Speaking of purposes, the HoseCoil is also a versatile garden hose, which is ideal for the home, RV or garden. So if you want more of your investment, you might want to give this product a second look in comparing with other garden hoses. One more thing that makes it a good pick is that it is backed by a 2yr warranty along with a 90-day return policy. That said you could have peace of mind whenever there is something that went wrong with your hose. You should also consider the HoseCoil water hose because it is easy to use while also lightweight. This hose is incredibly flexible that can give us ease of use in our backyard, garden or driveway or anywhere we need it. There is also no worry about tangling, kinking or twisting, and that’s thanks to its innovative anti-kink design. This one also includes ¾” GHT brass connectors that can be used with standard garden or home faucets. And when it comes to durability, you can also rely on the garden hose that can keep up with heavy demands. It is made with top quality materials, including polyester that ensures high performance. It also comes with an anti-corrosion coupling that can be used with different hose threads. Not to miss on this list is the Teknor Apex 8602-25. It is another top choice among RV owners when it comes to quality and durability. This product is made with reflex mesh patented technology, working to prevent any twists, tangles and kinks. It is an easy to use and operate marine hose that you can rely on for many uses in your yacht, boat, home, garden and recreational vehicle. Another thing that makes the product an ideal choice is that it is compliant with the Consumer Product Safety Improvement Act, which ensures its safety for being lead-free. You won’t go wrong with a hose like it that can give you that precious peace of mind when it comes to health safety. In addition, I noticed that the Teknor Apex 8602-25 comes with a Grip-Tite coupling that offers a leak-free and easy attachment at our faucet. For that, we can rest assured that we won’t have a hard time to operate and use the reliable marine hose. And for water flow rate, we can rely on its 5/8 inch diameter along with its length of 25 feet. Overall, the marine hose is one of the best choices for recreational vehicles, travel trailers, campers, cabins, homes and motorhomes. It can keep up with our heavy demands and the tough outdoor environments. Choose it if you’re looking for a drinking water hose that is made of FDA sanctioned materials ensuring health safety. Before buying an RV water hose, know that there are several types of hoses to choose from based on your intended purpose. In the following, we’ll talk about the different types of recreational vehicle hoses, so check them out. The heated water hose is one of the basic types of RV water hoses used by RV owners for their rigs. It is usually made with features including a thermostat that can regulate the water temperature passing through it. The main purpose of this hose is for heated water. It is also made from heavy-duty and certified safe for drinking water materials. You may want to go for it if you’re looking for a functional drinking water hose to use in your rig. The fresh water hose should not be used for anything but for filling the freshwater tank in your rig. This water hose can supply us with cooking or drinking water. That is why it should not e used for other purposes other than for drinking water purposes. Usually, this RV water hose has phthalate-free, lead-free and BPA-free components, ensuring it won’t leech chemicals in the water or leave plastic or chemical smell to it. The drinking water hose, as the name suggests, is for drinking water purposes. Water coming out from it is safe from contaminants and outer elements, including sediments that will pollute or make water dirty for human consumption. It is also made of durable and high quality materials. Some of them are also UV treated to ensure it can keep up with harsh weather conditions. You can also rely on its long-lasting use for its durable components. Overall, this hose is certified safe for drinking water supply. As said earlier, there are many types of RV water hoses, each with a specific purpose or use. The potable water hose is especially designed and made to work for potable water that we use for a shower, washing the dishes and watering the plants in our garden. It can also be used in marine like in washing the boat or yacht. It is also made from high quality and safe materials, containing no phthalate or BPA. You might also want to opt for one if you’re looking for a reliable water hose that you can use for the mentioned purposes. The anti-freeze water hose is what to use for an RV hose that can keep up with extreme temperature especially in the winter. 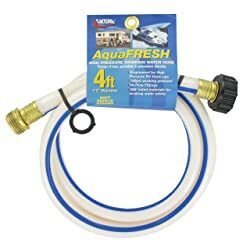 If you’re RVing even in the cold weather, you might want to use the water hose freeze protection hose to ensure of continued water supply in our RV. As it won’t freeze the water inside the hose, we can rest assured of continued water flow, too. Aside from such feature, this water hose is also designed to be kink-free and tangle-free, offering convenience of use. If you’re shopping around for the best RV water hose, you should also know what to look for, as there are many choices around. You must be able to consider some important features for a satisfying use. To learn how to buy a water hose for our recreational vehicle for your needs, keep reading the following for tips. The length of your RV hose matters when choosing an RV hose. You might want to go for a long one to suit many uses, including those with 6, 12 and 25 feet, to name some. But then, if you do not know how much farther you will be away from the water source, you might want to look for a longer hose. However, longer is not better all the time. Or else, you might find it hard to store it, as it will take a longer time to do that, too. Alternatively, you might want to go for hoses with various lengths. But again, LONGER IS NOT BETTER all the time. There are different diameters available in RV water hoses. It will translate to the water flow that you will be getting for using it. Many hoses are available with ½ inch, ¾ inch or 5/8 inch in diameter. The measurements are based on the hose’s inside diameter. As a basic rule of thumb, the bigger diameter will carry more water. Think of that. For the best results, you might as well settle for one with 5/8 inch in diameter because it offers an ideal combination of pressure and water flow but maintaining portability and being lightweight. Hoses may come in varying materials, but if you want to get more of your RV water hose, choose rubber. It is the ideal choice of RV owners that want more flexibility and convenience in using their water hose. While other materials, such as a combination of rubber and vinyl or vinyl only also comprise a water hose, most still prefers rubber and for reasons. Hoses made of rubber are long lasting and tough to keep up with heavy demands. While they can be heavier and more expensive, they are for long-term use. These hoses are also better at handling hot water, resisting kinking and preventing ozone deterioration. Rubber hoses are also good in terms of resisting cracking. Without even saying, they can offer you with more benefits than other materials can. What is the burst pressure? Answer this question to determine the strength of the hose. As you may know, some campsite water hookups have high water pressure level. If you would select a weak hose, it will be prone to rupture or bursting. For this reason, you should check that you’re buying a hose that has a high burst pressure rating to ensure it won’t be damaged by the high water pressure it has to keep up with from the water source. Are you using the hose with a sprinkler or a nozzle? If you are, you must find an RV water hose that has a burst pressure at least 350 PSI. But if you’re using for pressure washer use, you must check the user manual before buying the RV hose, as you might have to use a hose that can handle a higher PSI. The couplings are the other important components of an RV water hose. When shopping around, you must see to it that you’re going for one that can provide a leak-free use to ensure of a mess-free and no water wasting operation. You must not go for a hose with low quality couplings/fittings. More so, you should go for a hose with fittings, which are corrosion-free, so you don’t have to deal with rust. For a great choice, you should go for metal couplings, such as cast brass. If you’re looking for a durable choice, you might want to consider cast brass that is thicker, leak-resistant and most durable over other choices. They do not also bend easily or break down over time versus stamped metal couplings or fittings. 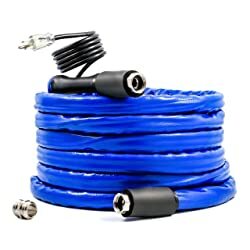 How do you quick connect the hose to your rig? It is easier than you think. When camping and parked in a campsite, there is water source, which can supply pressurized water into your vehicle. Remove the external cap in order to connect to the water inlet. Get your drinking water hose, which is approved by the National Sanitation Association. It contains no lead or rubber, or any toxic materials. Attach it to the unit or make use of an elbow connector for an easier and faster way to connect/disconnect to the inlet later. That’s it! Once we’re connected to the water inlet, we can expect pressurized water coming into our rig but bypassing the water pump, providing pressurized water to our toilets, showers, kitchens and faucets. You should be mindful of the water pressure. Some camping sites are using well that have a pump and water coming from it will have high pressure. You might need a pressure regulator to your hose before connecting it to the unit in order to control the water pressure. You might also want to use a water filter to get rid of water contaminants and sediments form the water before it gets into your rig. There you have the easy steps to have water supply to your rig from the city water inlet. With safe drinking water coming from the hookup, you can rest assured that things like taking a shower, using the bathroom or cooking will be easy even when camping or having an RV trip. In the following, we’ll talk about the different water hoses and accessories you should use for your recreational vehicle. The water hose is flexible that makes it easy to control and handle. It can promote ease of use when connecting it to your faucet. It has a leak-proof operation that can also prevent kinking, twisting and tangling. This RV hose is also made of heavy-duty materials that you can count on for long-lasting use. It will give you more value of your investment while ensuring convenience. This RV water hose is one of the most valuable because it is easy to store. It can roll into a small ball from its entire length so that you can keep it easily. You should find a hose with such collapsible feature if you want to save your time when it comes to storing your hose after use. Check out a hose that has a collapsible feature to ensure it can roll up and be kept easier and faster in the reel. This hose is specifically designed and made for the grey water tank, which is holding the dirty water from you rig’s kitchen sink and shower. You only use this hose for this purpose. It can keep your RV clean and sanitized with it. The RV water hose has anti-freeze features that make it ideal for use even in the winter or during storage of your RV in the cold season. Some of the hoses we have featured here have freezing protection that also ensures that there will still be water flowing into it even in freezing temperatures. The black water hose is what holds wastewater from your rig’s toilet. You should only use it for this purpose. This hose can keep your rig clean because disposing of wastewater from the toilet will be easier using it. Check out a thick and durable hose for the black tank to ensure it can resist pricks and punctures. Today’s RV water hoses are easy to store because many have a collapsible design. From their entire length, they can roll into a small ball that offers us an ease in storage. You can make use of a reel, which we will talk about in the next section for storing your hose. Choose one based on the diameter and length of your RV water hose. The hose reel is a spindle usually made of plastic, metal or fiberglass. This reel is used for holding the hose when in storage. Reels are categorized based on the length and diameter of the RV hose, the rewind system and the pressure rating. Check out the best hose reels for your RV water hose so that you won’t have a hard time storing the hose. The RV water hose with a heat tape can prevent freezing during the winter or extremely low temperatures. You can check out the following section to learn how to use a heat tape on the RV water hose to prevent it from freezing in the cold season. The easiest tip to prevent the hose from freezing is to disconnect it especially in the winter or during storage. But in the following, we’re going to discuss the easy steps to follow to keep the RV water hose from freezing. Fill your freshwater holding tank with water, ideally about 75% full to have enough supply of water once you disconnected the hose. Disconnect the hose from the water supply, like a faucet or water hookup. Detach it form the supply and RV connection. Store the hose in a place covered and away from the cold. Use a heat tape to prevent the hose from freezing due to the cold condition. What is a heat tape? It’s a system that is used in producing heat and at the same time keeping the optimal temperature of your RV’s water pipes. Using it, you can keep the hose from freezing. Wrap the heat tape along the entire pipe’s length, and then leave it hanging off your RV hose’s end. In order to cover it, you can use a section of insulation tubing that must be enough to cover the water hose’s length. You should wrap a duct tape over the insulation to secure the insulation that is wrapping the heat tape. You must know that the system is making use of electricity to heat the tape that’s enough to prevent frozen water hose and pipes in your rig. Get a heating pad and place it over the water pump of your RV. You should then plug it into the campsite’s electrical supply. Get a few towels and then lay them on the top of the water pump to protect it from the cold. You should also cover your water tank. Use a small lamp and put it in the holding tank’s compartment, and see to it that it’s between the tank and the pump to add more protection and prevent frozen water. Empty both the gray and black water tanks and then make sure to rinse the hose to prevent the freezing of solid waste. You should ensure you’re buying the best RV water hose that can keep up with the high water pressure. For this reason, you might as well go for one with 5/8 inch diameter. It is the reliable choice without being too heavy or bulky.